How engaged is your audience? The frequency that you post depends upon the engagement level that you see. It also depends upon the type of post you are making. If you are constantly pushing promotional items, the audience will disengage. For example, if you are a B2C business and you are sharing pictures of people you will probably build your engagement level. Videos these days are the rage on Facebook, especially if they are short and make someone laugh. Use it to your advantage. My rule of thumb is 70-20-10. The exception to that rule is if there is an event coming up, that 10% may rise to about 25% especially closer to the deadline for registration or the event itself. Here is the tricky part – the frequency. Because of the algorithms, the more often you post, especially on Facebook, the higher the likelihood of your audience seeing it. The algorithms have dropped to about 3% of the posts you put out actually make it to a followers news feed. That number, at one time, used to be 16% of your followers would see your posts. If you want higher engagement with fewer posts, you have to make sure that all of your posts hit! This won’t happen. 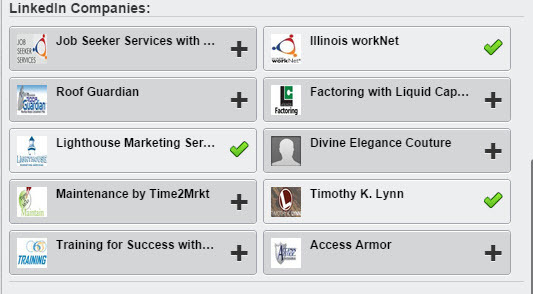 Try to arrange some “ringers” who will like and share your posts. This could drive the engagement rate and up the % of your followers that will see the posts. If you are following the 70/20/10 rule, you should build the engagement level as well as find out what kinds of posts are drawing the engagement. If you use a tool like Buffer or Hootsuite, you can use the auto schedule features they offer to pick the best time for follower interaction. But remember that as frequently as you post, you need to have someone checking to see if people are engaging with you. If they comment, you need to be able to respond, SOOOOO don’t post more frequently than you can manage to check back and follow-up if necessary. 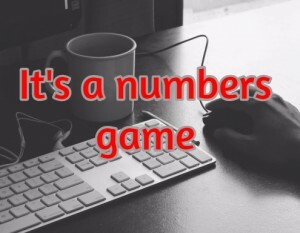 It really is just a numbers game. This 2014 article from FastCompany sums up more details that you can use as reference. 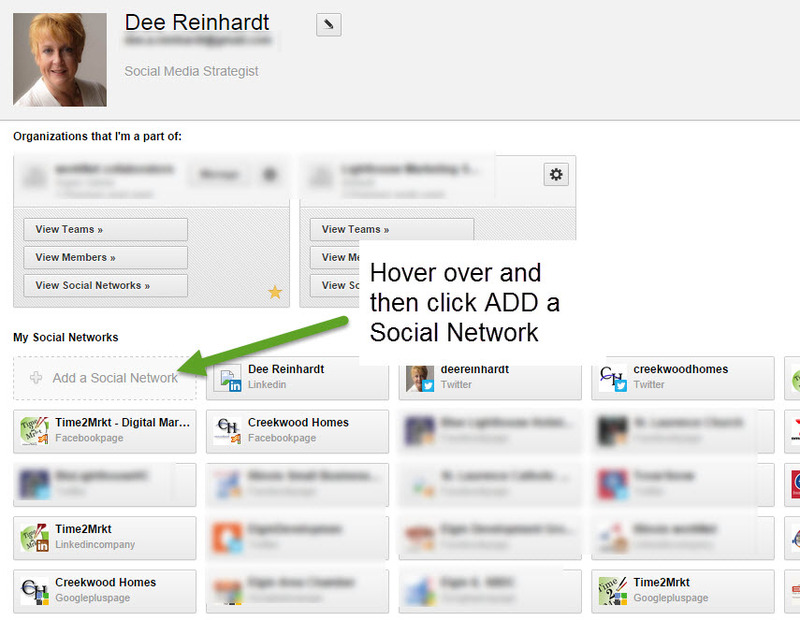 Try using a scheduler like Hootsuite to save you time. Sometimes we get busy and forget to post content to our social media platforms. What could you do to make sure that you are getting your message out socially and still run your business? 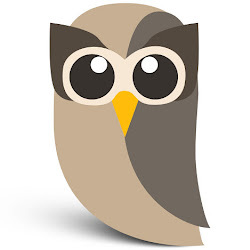 Try using a content scheduler like Hootsuite. It used to be that third party tools like these were dinged by the platforms because the content wasn’t posted directly. Recent research by others in the industry say that is no longer the case. During the week, you are reading your emails, run across some industry articles that you would like to share. Click on the icon in your Google Chrome browser to share your article. 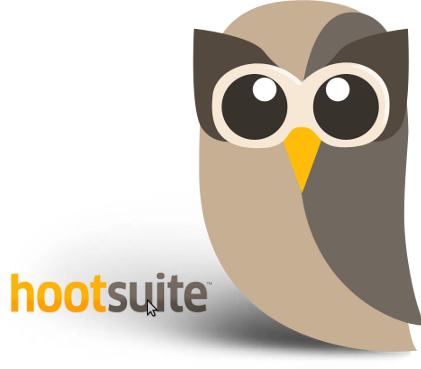 Let Hootsuite auto-schedule it for you. Hootsuite will pick the best time based on when your audience click on your posts. Thursday afternoon you are preparing for your vacation the following week. Take a few minutes to schedule the weeks posts, including the Monday and Tuesday for the week you return. You have an event coming up. 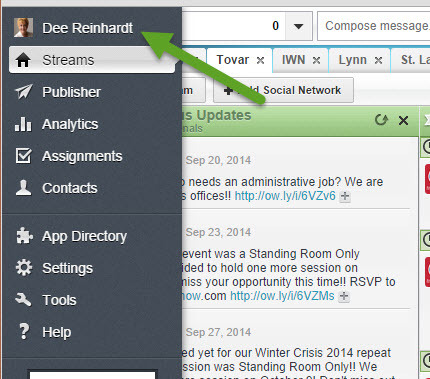 Create a few draft posts that you can share on the fly or schedule in advance – a few weeks in advance. Have a post that you want to share now? You can do that too! It even counts your characters so you can stay under 140 for Twitter. 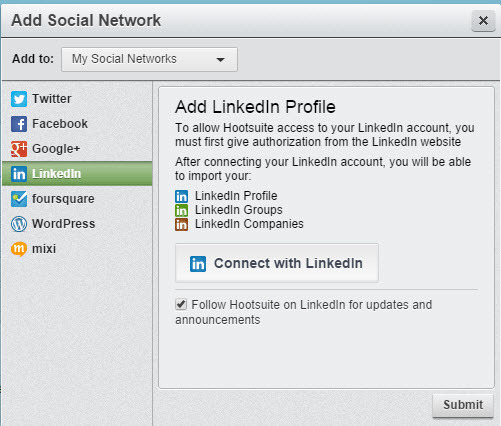 How will this Facebook Change impact your use of third party tools like Hootsuite? You will no longer be able to see your personal feed in the News Streams. Most of the time this will not affect most people, but if you manage a number of platforms through a third party tool, this means that you won’t be able to use it to manage your personal Facebook. It doesn’t appear to be affecting company pages, YET! One of the things that I love about Facebook is that almost everyone is using it. The thing that I hate about Facebook is that it is always changing. Sometimes not for the better. Sometimes I think they change just to change. Sometimes I think they change because they are trying to please their stockholders. No matter the situation, if we want to play in their field, we have to learn to roll with the punches!! 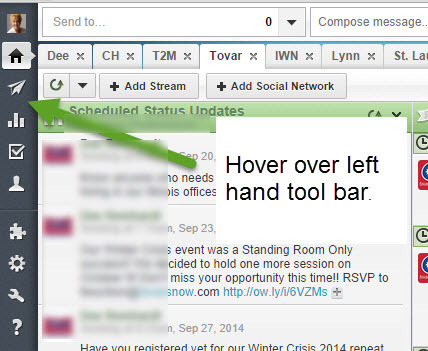 Hootsuite updated the way you save drafts. 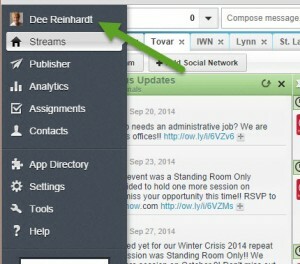 In the left dashboard menu, select Publisher, then Drafts. 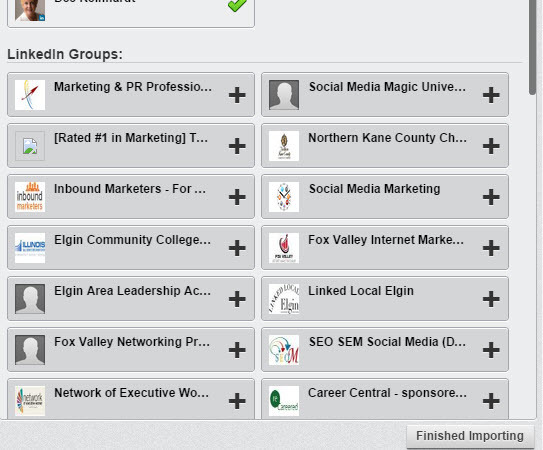 Sort or filter your drafts by selecting a specific profile. If you don’t want to keep a draft, delete it with the X. Select the draft you want by clicking the pencil, you can edit it or add additional platforms like normal. Send it now, or schedule a date for the post. At this time, the Auto-Schedule feature doesn’t work with the drafts. Either X the top right corner to close or “Clear” the compose box. What I like about this new option is you can sort by platform. Since I manage multiple business profiles, I can select the company for which I want to post and see all of the drafts that are available. This also allows an easier way to edit and save drafts. One thing I don’t like is the lack of the auto-schedule feature. That could change. Another thing I don’t like is I can’t see when I have other things scheduled when I am making the post. I will have to do some mental note taking or paper note taking to make sure I am not doubling up on a scheduled time. If you want to read all of the details check this article. Hootsuite is a great tool to use for scheduling posts! 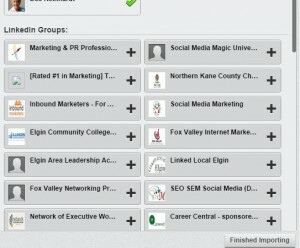 I wrote an article a while back about adding a LinkedIn company page to your Hootsuite scheduler. You can take a look here. 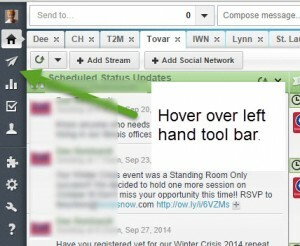 Hootsuite keeps adding great options to make it a time-saver when posting to social media. Their phone app isn’t as robust, but the desktop version is a wonderful tool. 6. Pick the platform that you want to add. 8. Add the group, profile or page that you want to post in or follow. 9. Once added, go to the streams and modify what appears in a stream! 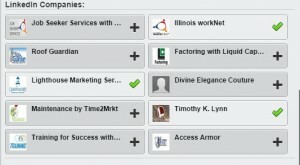 Only 10 LinkedIn Company pages or showcase pages are available. 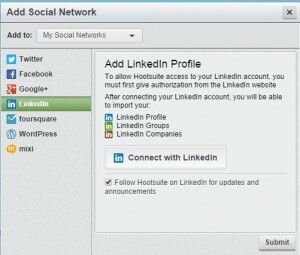 The one challenge to Hootsuite is you cannot add your personal G+ feed, and if you have more than 10 company pages including the showcase pages, you may not be able to see the company page that you want to add. That is something that Hootsuite needs to fix. Let me know if you have any other social media questions! I offer one-on-one consultations or small group classes. Take a look at all of my services here.